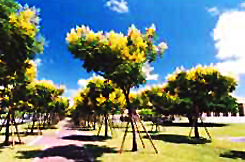 On November 3rd, 1984, the Yilan County Government 260th County Administration Meeting selected the Taiwan Rain Tree to be Yilan's county tree. The Taiwan Rain Tree is exclusive to Taiwan. It can be found growing in forests that are situated within 1000 meters above sea level. The tree grows with minimum diseases and pest infections. During September and October, the yellow flowers on the tree bloom. When the tree fruits grow, the crowns of the trees turn a brownish-red color and their capsules hang on the trees like small lanterns. The Taiwan Rain Tree grows in parks and fields in Taiwan, and can even be seen decorating the sidewalks in some foreign countries. 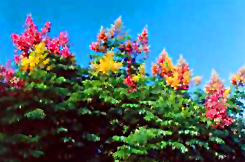 Deciduous, medium size arbor, Sapindaceae, alternate leaves, cone inflorescence, yellow flowers, flowering around September and October, frult with three wings, brownish red. Decorative uses, suitable for gardens and sidewalks. The outer ring of the Yilan Sports Park.